The natural products have really taken off since organic farming was first conceptualized in the 1920s. The popularity of natural health foods, like organic raw food and organic health food, has turned into an organic trend wherein even organic diapers are now being produced. One of the companies that has earned an excellent reputation for being a producer of organic and natural health food is Reed’s, Inc.
Reed’s, Inc. makes the top-selling sodas sold in natural food markets nationwide. According to food market research, it is currently selling in more than 10,500 supermarkets in natural health foods and mainstream supermarkets. Its six award-winning non-alcoholic Ginger Brews are unique in the beverage industry, being brewed, not manufactured and using fresh ginger, spices and fruits in a brewing process that predates commercial soft drinks. In addition, the Company owns the top-selling root beer line in natural health foods, the Virgil’s Root Beer product line, and the top-selling cola line in natural foods, the China Cola product line. Other product lines include Reed’s Ginger Candies and Reed’s Ginger Ice Creams. Reed’s products are sold through specialty gourmet and natural health food stores, mainstream supermarket chains, retail stores and restaurants nationwide, and in Canada. 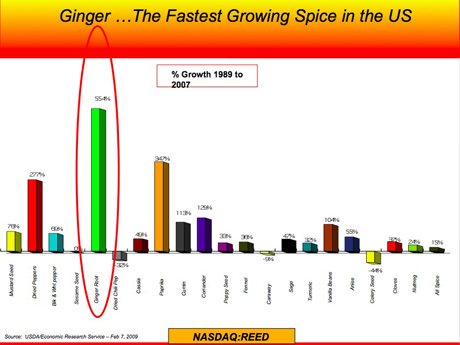 According to food market research done by the USDA/Economic Research Service on Feb 7, 2009, ginger is the fastest growing spice in the US. Reed’s, Inc. is evidence that innovative organic health food will continue to become a stable and growing sector of the natural health foods industry.